Still Pilgrim is a collection of poems that chronicles the universal journey of life as seen through the eyes of a keenly-observant friend and fellow traveler. The reader accompanies the Still Pilgrim as she navigates the experiences that constitute her private history yet also serve to remind us of our own moments of enlightenment, epiphany, and encounter with mystery. Each of the 58 poems of the collection marks a way station along the pilgrimage, a kind of holy well where the Pilgrim and reader might stop and draw knowledge, solace, joy, and the strength to continue along the path. At the center of this spiritual travel book lies a paradox: the Pilgrim's desire for the gift of stillness amid the flux and flow of time, change, and circumstance. "Be still and know that I am God," sings the Psalmist, channeling the voice of the divine. "Teach us to care and not care. Teach us to sit still," prays the poet, T.S. Eliot. 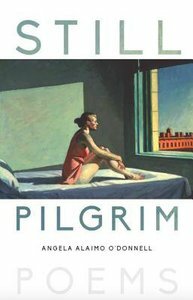 Still Pilgrim depicts and embodies this human dilemma--our inevitable movement through time, moment by moment, day by day, and the power of art to stop both time and our forward march, to capture the present moment so we might savor the flavor of life.